Overall, the N97 is a flawed gem. Its size might not be for everyone, and the poor stability is likely to be tolerated by only the most enthusiastic of users. Which means it can only be recommended to tech enthusiasts who are prepared to work through the problems. Otherwise, the N97 mini will probably give a smoother day to day experience. 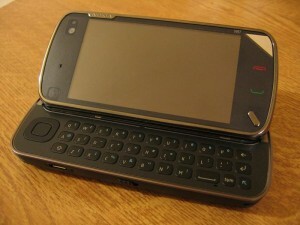 The N97 mini that David talks of is actually a device that I currently own. It’s slightly smaller than the N97 – 3.2 rather than 3.5 inch screen – has a little more metal in its frame and a deceivingly improved keyboard. The mini also has more RAM (though much less on-board storage) which is cited to be the real deal-breaker by most reviewers – including David – of the original N97. Of note, I’ve considered selling the Nokia N97 mini a few times – I’m fickle like that – but I can’t quite let go of its form factor and excellent BBC iPlayer (and podcast) support.